Whether you are looking to join the PTA, learn about volunteer opportunities, check out the calendar of events, get details on one of our fundraisers, or read the minutes from the last PTA meeting, you have come to the right place. We value our parent and teacher members and together we can help provide the best learning experience for our students. RUN THE AMAZING RACE AT THE JLES 2019 INTERNATIONAL NIGHT! all your tasks and walk away with a prize! Be part of the fun this fantastic night and host a booth! Sign-Up now and help us spread the excitement of learning about different countries around the world. Download the form below and turn into school! Gaithersburg, MD — November 30, 2018 — Jones Lane Elementary School’s Parent Teacher Association (PTA) is excited to receive a $2,419.27 grant from Safeway and Safeway Foundation from their Hunger Is initiative to eradicate childhood hunger. The funds will be used to launch the new "Break Box" Food Program for school holidays. The Break Box will consist of a combination of healthy, pennywise, kid-friendly, and culturally appropriate food items to help ensure that JLES students have sufficient food during extended school breaks (Thanksgiving, Winter Break, and Spring Break). The goal is to continue to provide meals during breaks to those students who are eligible for free and reduced-price meals at school. The Break Boxes will be distributed to JLES students and families at the start of each school vacation. Hunger Is, a charitable program of Safeway Foundation, is designed to build awareness and raise funds in an effort to eradicate childhood hunger in America. Funds raised through Hunger Is focus on adding breakfasts in and out of school through federal nutrition programs and other means to combat childhood hunger and improving other health-related outcomes. Each Safeway location selects a local organization or food bank to receive the donations. Funds for our $2,419.27 grant were collected by the Safeway store at Darnestown. Safeway Foundation, part of Albertsons Companies Foundation, supports causes that impact our customers' lives. Our stores provide the opportunity to mobilize funding and create awareness in our neighborhoods through generous contributions by our customers, our employees' passion, and partnerships with our vendors. We focus on giving locally in the areas of health and human services, hunger relief, education, veterans and helping people with disabilities. During 2017, Safeway Foundation in Safeway’s Eastern Division invested more than $1.4 million in our neighborhoods. More information about Safeway Foundation can be found at www.safewayfoundation.org. The Jones Lane PTA has partnered with Lyft! In order to reduce barriers for parental involvement, this fundraiser will provide funds in the form of Lyft gift cards so families can attend parent teacher conferences, meetings, events, volunteering opportunities, and more. 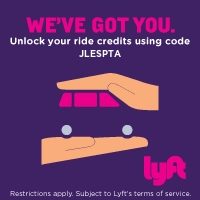 Use code JLESPTA and the PTA will receive $5 in its account at no cost to the rider or driver. If you would like to make a donation, please contact president.jlespta@gmail.com or make a donation via Pay Pal to treasurer@jlespta.org. La PTA de Jones Lane ha iniciado una asociación con Lyft. Estamos recaudando fondos para reducer barreras al involucramiento de los padres. A través de este servicio, familias interesasdas podrán recibir tarjetas de regalo para asistir conferencias con maestros, reuniones, eventos, trabajar como voluntarios, y mas. Use el código JLESPTA y la PTA recibirá $5 en su cuenta a ningún costo al cliente o chofer. Si gusta hacer una donación, favor de contactar a president.jlespta@gmail.como hacer una donación atraves de PayPal a Jones Lane Elementary School PTA. Si gusta utilizar este servicio, favor de contactar a Jessica.Berrellez@gmail.com or (301) 300-8429 para mayores informes. and turn in your training completion certificate to the JLES main office before volunteering. Volunteers for large scale events or one-time events do not require the C.A.N. training. Class parties, Halloween parades, parent visitation days do not require the training. If you are a volunteer that comes every week (regularly) to help with reading groups or create bulletin boards, etc. you would require the training. If you took the training during the 2016-2017 school year, you do not need to take it again for 3 years. If you are taking it for the first time during the 2017-2018 school year, you do not need to take it for another 2 years.